Since July, a special MAN truck can be seen cruising around Dutch roads: Porsche Centrum Gelderland uses an MAN TGX special transporter with paintwork matching the colours of the legendary "Martini Racing Team". The truck boasts the looks of the successful historic Porsche racing cars renowned as multiple winners of the 24-hour Le Mans races of the 1970s. 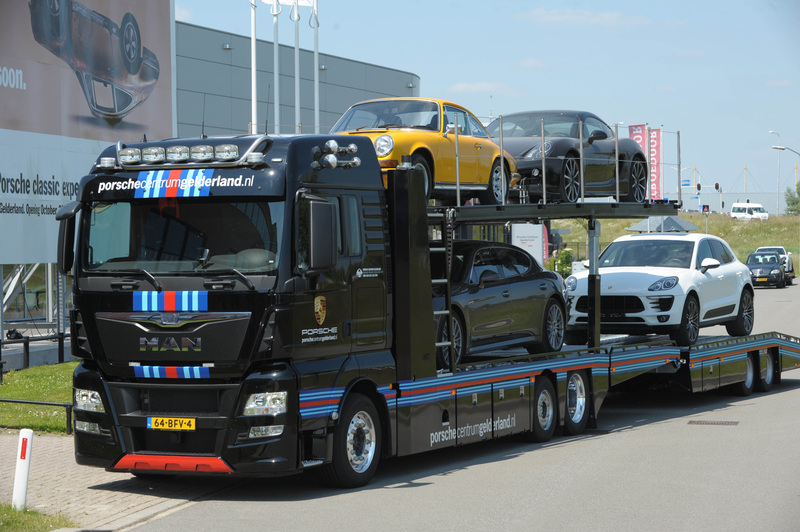 Porsche Centrum uses the 400 HP MAN TGX 6x2 to collect customer cars. Accordingly, the special transporter is equipped with special low-profile ramps and full air suspension allowing for fine adjustment of vehicle height. This enables even very low-built sports cars, historic Porsches or racing cars to be loaded on to the truck. The TGX and its trailer are equipped with guards all along the side, with large storage compartments to accommodate the materials needed for cargo securing. MAN Image Database "TGX in operation"
Image "MAN TGX designed like the legendary Porsche-Martini racing cars"